The workshop will provide participants with the skills required to plan, implement and monitor a project to manage and restore grassy woodland remnants. Learning will be through a combination of theory presentations and field-based activities. The workshop has a particular emphasis on managing grassy woodland remnants but is relevant to the management of other vegetation types. where to get help including an overview of funding opportunities. Further information, including a full program and registration details can be found on the workshop webpages: Scone & Moree. The ANPC is hosting a two day workshop on plant identification for grassy ecosystems in Deniliquin NSW 24th – 25th September 2012. The workshop will introduce participants to grassy ecosystems, their diversity, ecology and provide the skills and information required to positively identify a range of common grassland plants. We will use some of the most commonly encountered plant groups, including grasses, eucalypts and daisies, to introduce you to the best identification resources (printed, on-line, and interactive). You will also learn how to access the experts through the identification services of the major herbaria. Along the way we will de-mystify identification ‘keys’, and introduce you to useful field characters to look for. The workshop is targeted at the beginner level, but will also provide a good opportunity for those more experienced in plant identification to refresh their skills. Further information, including a full program and registration details can be found here. Abstracts are invited for ANPC’s 9th National Conference to be held 29 October – 2 November 2012 in Canberra. 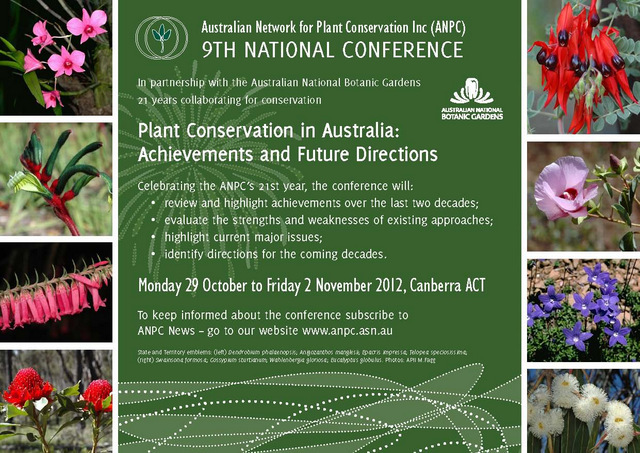 The overall conference theme is plant conservation in Australia, achievement and future directions. Abstracts are invited for conference presentations, posters and workshops. Closing date for abstract submission is 17 August 2012. We are seeking articles for the September – November 2012 issue of Australasian Plant Conservation (APC), the bulletin of the Australian Network for Plant Conservation. The issue will be on the theme ‘Landscape Restoration’ and will highlight current landscape scale restoration efforts. General articles not on the theme are also welcome. We also welcome: book reviews; notes regarding interesting recent publications or resources; and workshop, course and fieldwork announcements. Deadline for submissions for the September – November 2012 issue is Friday 10 August 2012. If you are intending to submit an article or wish to discuss possibilities, please contact the Editor, Selga Harrington. Your final article must be submitted to Selga by email at selga.harrington@gmail.com. Australia is now pursuing the implementation and ratification of the Nagoya Protocol. The ‘Nagoya Protocol on Access to Genetic Resources and the Fair and Equitable Sharing of Benefits Arising from their Utilization’ is a global agreement that implements the access and benefit-sharing obligations of the Convention on Biological Diversity. Australia signed the Nagoya Protocol in January 2012, and is now developing its approach to implementation and ratification. The Department of Sustainability, Environment, Water, Population, and Communities invites you to provide your views on the best way to implement the Protocol in Australia. You can find more information on making a submission here. Initial submissions due by 17 August 2012. The 'Linking Landscapes through Local Action’ project was established in 2012 as part of the NSW Governments Green Corridors program. Funding of $9 million is being allocated to a grant program targeted to public land managers in the Sydney basin that are willing to manage bushland for conservation purposes. Expressions of interest (EOIs) will be sought from public land managers in the Sydney Basin from August 2012 onwards. For more information visit: http://www.environment.nsw.gov.au/conservationprograms/linkinglandscapes.htm. The NSW Environmental Trust invites applications to its Environmental Restoration and Rehabilitation Program. The objectives of the program include ‘to restore degraded environmental resources, including rare and endangered ecosystems’ and to ‘to protect important ecosystems and habitats of rare and endangered flora and fauna’. Applications close on 31 August 2012. The recently released Biological Control of Weeds in Australia by Mic Julien, Rachel McFadyen and Jim Cullen, reviews the history of biological control in Australia. The book covers over 90 weed species and a multitude of biological control agents and potential agents. Each chapter has been written by practising biological control of weeds researchers and provides details of the weed, the history of its biological control, exploration for agents, potential agents studied and agents released and the outcomes of those releases. Further information on the book can be found here and in this article on Why the invaders are winning. Weeds of Northern Australia, published by the Environment Centre NT, describes 150 weeds of Northern Australia and provides information to help land managers identify and eradicate weeds. The guide includes photos and descriptions, distribution maps, detailed botanical drawings and ecological information and recommended control methods. More information here and can be purchased from The Environment Centre NT. On 20-21 September 2012 the Sydney Olympic Park Authority will be running a practical workshop on ‘Managing Constructed Wetlands and Water Plants’. This workshop is suitable for anyone contemplating on construction and management of urban wetlands, especially those who are planning to manage development works around wetlands. Participants will gain a hands-on learning experience and acquire pragmatic approaches in managing constructed wetlands and water plants, including weeds. Emphasis is placed on successful examples elsewhere and in Sydney Olympic Park. The conference program has been released for the National Landcare Conference to be held at the Sydney Convention and Exhibition Centre from 3 - 5 September 2012. This year’s conference will take place in Landcare Week and will be an exciting opportunity to bring together people that are interested in creating sustainable landscapes for the 21st century. On Sunday September 9th in Landcare Week, at over 100 city and country locations across Australia, everyone is invited to gather and do their bit for our remaining bushland. Bushcare’s Major Day Out is a day specifically designed to give of us the opportunity to find out what is being done and what can be done in our own neighbourhood. It’s a fun day where anyone, young and old can work alongside and learn from experts and experienced volunteers. There are a range of activities depending on the location; walks, planting, weed removal, photography workshops as well as native plant identification and well celebrated morning teas. Councils, Landcare, Bushcare groups and others are invited to post the details of their event on the website. Please send your details (location, organiser, time, details etc) to: info (at) bushcaresmajordayout (dot) org. Society for Conservation Biology’s Oceania section are holding a regional conference on Conservation Biology in Oceania 21st – 23rd September 2012 in Darwin. The theme is 'People and Conservation in Land and Sea Country'. Land and sea country are terms used by Indigenous people in northern Australia to refer to the environments they have managed for millennia. The philosophy underlying land and sea country management of passing on the knowledge and values inherited from ancestors to descendants is widely shared by conservation biologists across the globe. The meeting will showcase Indigenous conservation management while highlighting the tools and knowledge now available to all conservation practitioners in caring for land and sea country. More information available from the conference website. The Australasian Systematic Botany Society will hold their 2012 conference in Perth 23-28th September 2012. The conference theme, Local knowledge, global delivery, follows from last year's landmark International Botanical Congress in Melbourne, where sweeping new changes surrounding the publication of new taxa were proposed. More information available on the conference website. The SER-Australasia Inaugural Conference will be held in Perth, Western Australia, 28-30 November 2012. For land managers, scientists and practitioners who work in biodiversity restoration, this SERA meeting will provide a critical international forum at a time of significance for the region's species, ecosystems and landscape. The ANPC will be presenting a symposium on the role of plant translocations in restoring and maintaining biodiversity: policy, planning and practice. For more information and to register visit the conference web page. Do you have any plant conservation news that could be of interest to the readers of ANPC News? Email your news to anpc@anpc.asn.au making sure to put "For ANPC News" in the title. Please keep your news item concise, preferably one paragraph, and provide a link that readers can click for further information. Images welcome. We introduced the establishment of the Intergovernmental Platform on Biodiversity and Ecosystem Services (IPBES) in a recent ANPC News. Keen to know more? An article on the platform was published in a recent issue of Decision Point. The article (on page 12) by Emily Nicholson discusses the functions of IPBES and its potential impact on biodiversity conservation.